An earlier version of this story misspelled the name of ARC wide receiver Zack Suarez. Despite 259 passing yards from starting quarterback Jihad Vercher in limited action, American River College’s football team went down in flames Saturday night against Modesto Junior College, losing the first game of the season 41-10. 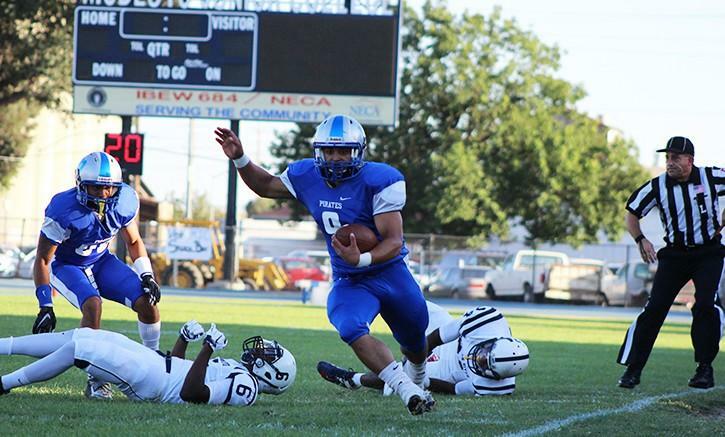 MJC’s no-huddle offense successfully ran the ball all night to the tune of 212 total yards, as starting quarterback Trey Cooper and a team of running backs ran a read option offense that took the team down the field in long, consistent drives. ARC’s offense struggled to retain the ball, throwing four interceptions total among three quarterbacks, and losing a fumble that was returned for an MJC touchdown. Vercher, who was pulled in the third quarter when the game was seemingly out of reach, was behind center for the entire first half, where the offense’s first four drives all went three and out. According to defensive captain and linebacker Jordan Kunaszyck, those three and outs kept the defense on the field and out of breath during MJC’s three first half touchdown drives. Second-year head coach Jon Osterhout, who no longer is tagged as interim, agreed. “We weren’t able to move the ball offensively the first few drives, and really put our defense in a hole field position wise,” said Osterhout. But Vercher had measurable success throwing to ARC’s collection of wide receivers, most of whom seemed to be at their best on long throws, using their height advantage over MJC’s shorter secondary. Vercher finished 16-27, with two complete passes in the endzone; one was a touchdown to receiver Zack Suarez to make the score 20-10 going into halftime. The other was picked off on ARC’s first drive of the second half, when it seemed poised to pull within one score of MJC. MJC scored two more touchdowns in the third, and picked off ARC quarterbacks Chris Guillen twice and Evan Moore once to prevent any sort of comeback. Vercher, a second-year quarterback who spent his first year of eligibility at Sacramento State as a backup, said MJC didn’t do anything that should have made ARC fall apart the way it did. For next week’s home opener against De Anza, the team says the focus and intensity will be there. Be the first to comment on "ARC falls 41-10 in season opener against Modesto"